PRAISE NO ONE BEFORE HE SPEAKS, FOR IT IS THEN THAT PEOPLE ARE TESTED. Our readings this Sunday remind us that our speech is a reflection of the goodness in our heart. It is a reflection of our upbringing and of the care we have for others. Our Gospel teaches us, "Every tree is known by its own fruit." In our first reading (Sirach 27:4-7), the wise sage Yeshua ben Sira reminds us that our faults appear when we speak. Our speech discloses the bent of our mind. When a sieve is shaken, the husks appear; so do one's faults when one speaks. As the test of what the potter molds is in the furnace, so in tribulation is the test of the just. The fruit of a tree shows the care it has had; so too does one's speech disclose the bent of one's mind. Praise no one before he speaks, for it is then that people are tested. In our Gospel reading (Luke 6:39-45), we hear the conclusion of Jesus' Sermon on the Plain. Here, Jesus speaks about the blind leading the blind, not judging others and looking inward at our own failings rather than outward at the faults of others. Jesus told his disciples a parable, "Can a blind person guide a blind person? Will not both fall into a pit? No disciple is superior to the teacher; but when fully trained, every disciple will be like his teacher. Why do you notice the splinter in your brother's eye, but do not perceive the wooden beam in your own? How can you say to your brother, 'Brother, let me remove that splinter in your eye,' when you do not even notice the wooden beam in your own eye? You hypocrite! Remove the wooden beam from your eye first; then you will see clearly to remove the splinter in your brother's eye. "A good tree does not bear rotten fruit, nor does a rotten tree bear good fruit. For every tree is known by its own fruit. 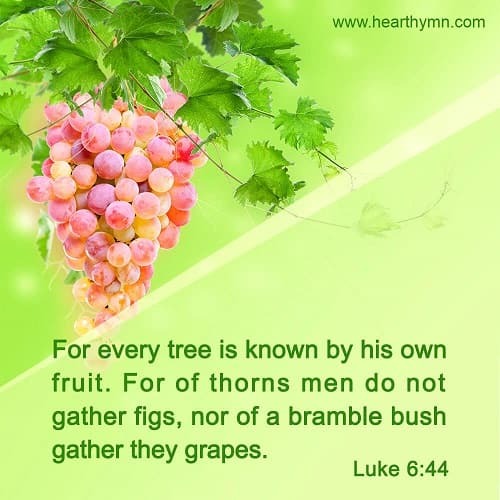 For people do not pick figs from thornbushes, nor do they gather grapes from brambles. A good person out of the store of goodness in his heart produces good, but an evil person out of a store of evil produces evil; for from the fullness of the heart the mouth speaks." In our Epistle reading (1 Corinthians 15:54-58), St. Paul teaches us that the sting of sin is death, but through Christ Jesus, God gives us victory. We must remain firm and steadfast in our faith, fully devoted to the work of the Lord..
Brothers and sisters: When this which is corruptible clothes itself with incorruptibility and this which is mortal clothes itself with immortality, then the word that is written shall come about: Death is swallowed up in victory. Where, O death, is your victory? Where, O death, is your sting? The sting of death is sin, and the power of sin is the law. But thanks be to God who gives us the victory through our Lord Jesus Christ. Therefore, my beloved brothers and sisters, be firm, steadfast, always fully devoted to the work of the Lord, knowing that in the Lord your labor is not in vain. We who speak ill of others, judge others harshly while ignoring our own faults reflect the sadness of our own hearts. As Jesus said in our Gospel, it is like the blind leading the blind. In the words of Fr. Eugene Lobo, "Instead of criticizing others, it would do a world of good if we cared for them."